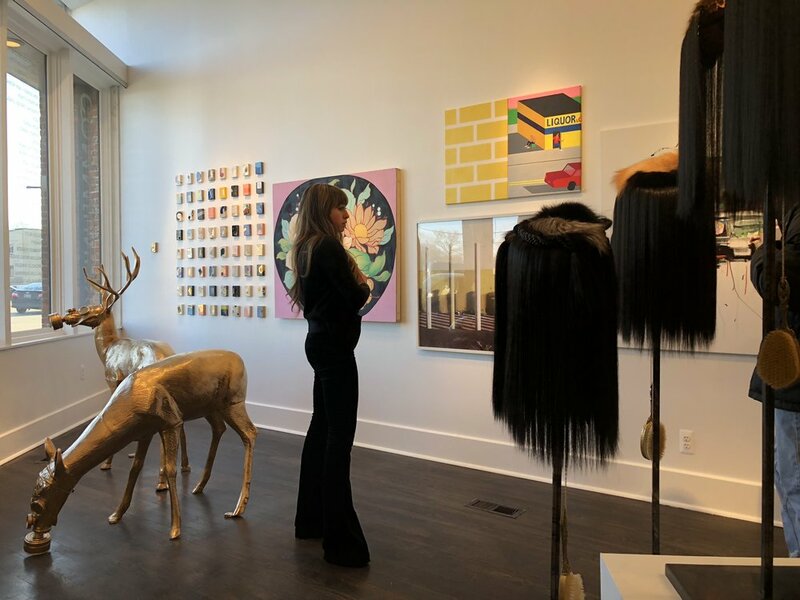 Round of applause for Paulina Petkoski and Samantha Schefman, PLAYGROUND DETROIT is a vibrant new gallery with an authentic mission. The tiny space packs a big punch. Located at 2845 Gratiot Avenue, off the beaten path of Eastern Market, near where Grenadier once was (R.I.P. forever in our hearts). It will be interesting to see what businesses take advantage of the newly broken bubble and move to spaces further down Gratiot. Samantha led a curator talk and guided guests through PLAYGROUND DETROIT's inaugural exhibition, COMM[UNITY], on December 23rd. The exhibition showcased an eclectic combination of work from 36 artists practicing in Detroit. 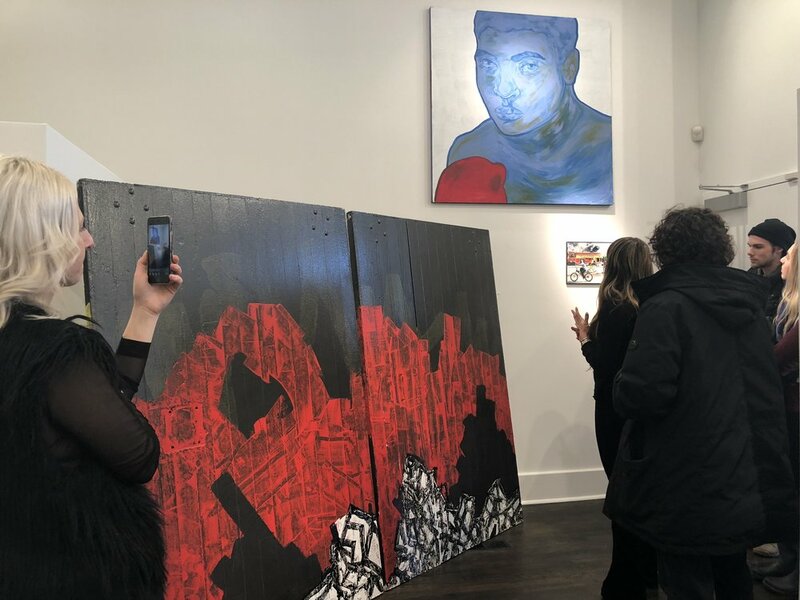 The mix of multimedia projects came together seamlessly; sculptures, installations, paintings, pictures, and videos were cohesively staged in the space. Avant-garde pieces like Cristin Richards' sculptures made of human hair were mixed with recognizable work by Ouzi and Ellen Rut. Exhibiting artists include: Kristin Adamczyk, Marlo Broughton, Scott Campbell, Dustin Cook, Jon Dones & Ash Nowak, Patrick Ethen, Hygienic Dress League, Nick Jaskey, Sydney James, KATAI, Scott Klinker, Steve Kuypers, Malek Lazri, Luke Mack, Justin Marshall, Steve McShane, Nic Notion, Eleanor Oakes, Ouizi, Cristin Richard, Rachel Roze, Ellen Rutt, Jacx, Paula Schubatis, William Irving Singer, Michelle Tanguay, Vaughn Taormina, Dessislava Terzieva, Thing Thing, Zac Thompson, Elysia Vandenbussche and George Vidas. Samantha walked guests through a tour of the exhibition and talked about the meaning of each piece, gave information on the artist, and discussed the significance of the work/artist to the story of Playground Detroit, as a whole. Since founding PLAYGROUND DETROIT in 2012, Paulina and Samantha have worked with over 200 creatives in the city. COMM[UNITY] brought together and showcased pieces from artists that have been instrumental to the company's growth over the years and personally significant for Samantha and Paulina. Samantha teared up while telling the audience about a father and son who regularly visit the gallery on the walk home from school. Playground Detroit has hosted community art classes and will feature the work in an upcoming exhibition. Samantha talked about the importance of exposing the surrounding community to art. It gives people from the neighborhood an opportunity to experience creativity and inspiration. Phone by Dessislava Terzieva, Paintings by George Vidas, Dustin Cook, and William Irving Singer. Artist, Cristin Richard, with her sculpture. Spectators can use the attached antique brushes to brush the hair. It’s really weird and really satisfying. Cristin says it helps with maintenance because the pieces can be worn as shoulder shawls and when they are, the hair gets knotted. Dustin Cook, a recent CCS graduate, was on site to represent his work. 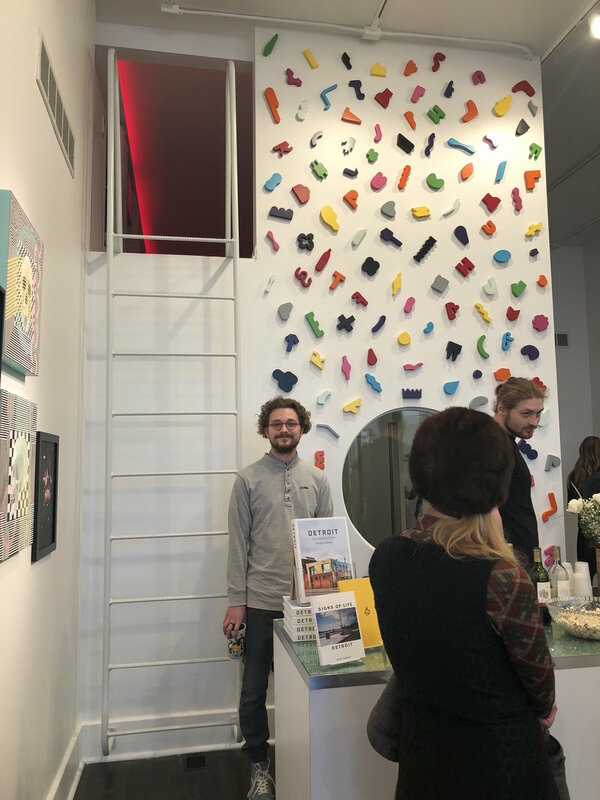 In addition to showing two multimedia paintings in the exhibition, Dustin made the installation on the far wall, photographed above. I love the installation, it reminds me of a reimagined version of magnetic alphabet letters on a refrigerator. Paintings by Nic Notion. His art was featured in advertisements for the Detroit movie, as a result of a collaboration between Playground Detroit, Annapurna Pictures and our sister company, Brooklyn Outdoor. Read more about it here. Samantha explains that Patrick Ethen and Tony Katai have chosen to stage their pieces as they are so Patrick's light work will reflect onto Katai's visual and look like a part of the work from certain angles. Peep that last name, our very own Candice Simons is a founding member! For more pictures and information on the exhibition click here. Due to popular demand, the exhibition has been extended until January 13th. The Gallery is closed for the holidays until January 3rd and will reopen Wed-Friday 12-6 Sat 12-4. So much love for Paulina and Samantha. The two have pulled together a tremendous feat and should be wildly proud of themselves. Listening to the girls talk about the artists they work with, the community they serve, and their intentions for the space is inspiring. It's clear PLAYGROUND DETROIT has a genuine mission to support Detroit artists and include all members of the community.